A place to park when you visit Jekyll Island. Swimming pool not heated, the small pond not a place you would want to paddle around on. Just lots of concrete. It is easy to park on the pull through sites. Nice sites but it is close to I95 with the constant traffic background noise. The internet was not useable 98% of the time even with a strong signal from the nearby tower. I asked the office ladies about the un-useable internet and reply I got was unbelievable. She said well "we aren't charging you for it". Hardly a 10/10/10 response. There are better choices out there. This was our second stay when we travel south for the winter. Wonderful and gracious staff. Beautiful and roomy sites and spectacular cleanliness. We plan on staying a few days in the spring when we return north. We enjoyed the stay but the attitude of the desk clerk when we complained about the WIFI going out every night to the point we could not even check our email was unwarranted. Maybe it was just a bad morning for the person? Would I stay here again? Yes, but don't expect much if you want WIFI . We were house hunting and using the computer was a must. If you don't need WIFI then you will enjoy the residents .. Things appeared great upon arrival, Park and restrooms are very clean. Sites are small no room for chairs. EVERY't THING MUST REMAIN ON THE PAVEMENT. NOTHING on the grass NOTHING. Don't expect to take a hot shower, do laundry or use the pool while your here. The owners have there own agenda and close and shut things off at there will. We planned a afternoon at the pool and doing laundry. Got to the pool it was completely drained. No NOTICE NO WARNING, Went to do Laundry, 2 of the machines were down. went to take a shower no hot water. So I speak to the owner who lies and says tthe " Health Department" shut down the pool and he had to drain it. Yet there are No posted notices From the " Health department" ?? I inquire about hot water he says you didn't let it run long enough. I said I waited 5 minutes . he mumbles something. mean while we go to get change to do laundry. No change and No available machines only 2 of the 4 are working. So our entire planned afternoon ruined Our last day There and we extended our stay. I go to the office to complain and they could care less. i asked why we weren't notified the pool was going to be closed when we extended our stay. No answer. I ask how hard would it have been to hand out notices the pool would be closed that morning when they picked up trash. I stand there telling them how upset I am explained its my last day, they don't care. i stand there she just looks at me. I said aren't you going to say anything she mumbles sorry. like I was pulling teeth. the owners are RUDE and uncaring. it maybe clean, But NO CUSTOMER SERVICE OF ANY KIND !!!! Conveniently located park right off I-95 with good sites and amenities. The park has a nice pool, bathroom and shower facility along with a pavilion to hold events that need more seating. The sites are all concrete, flat and easy to navigate with plenty of room for a tow vehicle. The park provides cable service and decent wifi. We enjoyed our stay here and will be returning to do more exploring of the GA coast. See our full reviews and all of the pictures at our blog at thegilliamsisland. 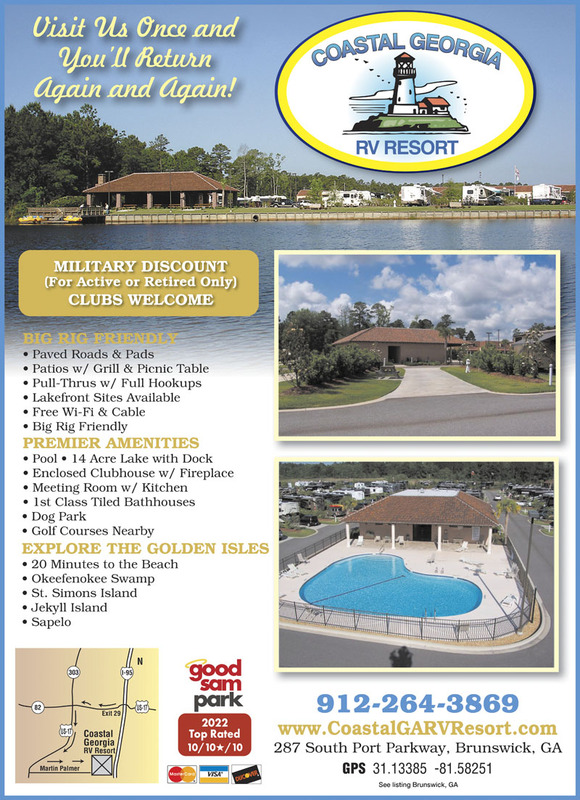 We enjoyed our one-night stay at this RV resort. We did not use any of the facilities so no rating available. The park is very clean and all sites are paved. 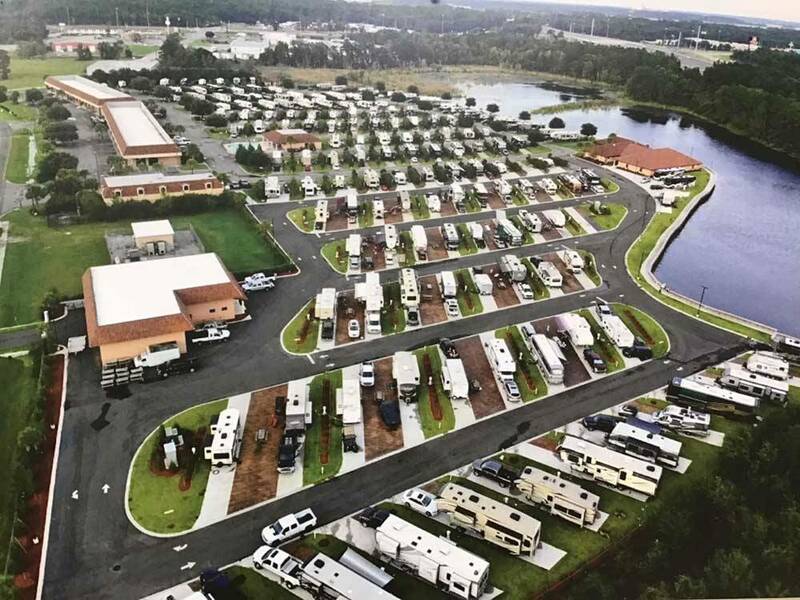 Easy on and off I-95 and easy entrance and exit from the RV park with our 40' MH and tow. Very little interaction with the office personnel but checkin was easy and quick. We definitely plan to stay here again on our trip back north from Florida. One flaw: horrible cell signal. I bring my own Verizon and AT&T hotspots as well as other devices to assist with getting clear signal since I work remotely. Although I can see the cell tower, something is severely wrong with Verizon in this park. AT&T I was able to get 2mbps download for work, but it faded in and out. I think the CG knows this as they have range extenders located throughout, but their WiFi was unusuable. If you do not have to work, this is a fantastic park. Clean, nice paved pull through for even the largest rigs. Love the shrubbery between the sites. Park was quiet. Small fenced in dog area (good for medium to small dogs). Very close to any store you could think of and a mall. They also will accept packages so you can order what you need from amazon. Great park, just not great internet signal. When you leave the park we started to pick up signal on our phones better. Something is causing interference within the park, but we did have a spot right in the middle and under their range extender. This was a one night stopover on our way to FL. This was our first time staying at this park. Sites are concrete and level though narrow and tightly spaced. We have a 45' rig and manuvering through park and into and out of site was a little tight. Bathrooms were clean. We would probably stay here again. This park is excellent. Convenient to Jekyll, St Simons, St Mary's and Brunswick Ga. Level concrete pads, Very clean restrooms and park in general. You can wash your rig on site with no extra fees or there is a detailing company in the park to clean it for you. Near 95 but road noise is minimal, perfect for overnight or long term. Nice park, but 50 amp power is nonexistent. Old worn out circuit breakers! The breaker pops open with less than 35 amp draw. Turns are too tight for 45 foot rigs towing without running over the grass. Most will have to disconnect in order to get out of the site. Don't know how they got into big-rigs-rv.com! Beautiful campground! Nice, big, concrete pull-through sites, with a concrete patio for the picnic table. Huge covered area for groups to get together. Next to the water! Best part was recommendation to go to Brian Strickland for repairs (listed on their brochure). He came out quickly, diagnosed the problem, told us what we needed, and charged us the minimum. Appreciated it VERY much! This is a very nice campground, conveniently close to the 95. Came after hours and our info was ready. Site was pull through and large and leveled. We stayed 3 nights on our way to Florida on the coldest nights of the years (well not really cold by Canadian standards) but a touch below freezing so we were not able to de- winterize our trailer. We had to use the bathroom and showers but were clean and in good shape. Just a little sulphur smell from the water. We visited St-Simons Island and Jekyll Island both fairly close to the campground. Groceries nearby and TA. We stayed one night on the way back to Canada. Stayed one night on trip from NC to the Tampa area. Convenient to I-95 and easy fuel stations. Not a lot of road noise. Large pull-thru sites with plants between for more privacy. Easy in/out. Did not use pool or laundry facilities. One of the better sites we have stayed in. Slightly tight quarters. 32' Class C towing 53' total. Follow the directions on the resort website to avoid several unnecessary turns. We stayed two nights while traveling from Pennsylvania to Florida. Very nice park with shrubs between sites giving a sense of privacy. The wifi was available throughout the park and we had good reception. Several rows with sites parallel down each row. Very regimented with just "token" trees. Most sites were drive through, with concrete pads, easy hookups, thick green grass, but just not overly large. There was a row of hedges on one side for more privacy. Very easy to get around in though. Friendly staff. Internet signal was strong with decent throughput (bandwidth). This is a relatively new park located just off Interstate 95 near Brunswick, GA. It is a very nice park with nice asphalt driveways, concrete site pads and patios with a picnic table and grill. Except for the perimeter sites, all sites are long pull throughs. The sites are separated by a grass strip planted with large shrubs to create a bit of separation and privacy. There are some trees but they are small since they aren’t very old. There is a pool but we didn’t use it (not the right time of year). The laundry is large with plenty of machines in good condition. The bathrooms are in excellent condition and are kept clean. The only thing that would hold me back from total satisfaction is that our site pad was not level. Why would you build a new RV park with concrete site pads and not make them level? Certainly, it was manageable but just surprising. We had full hookups with 50 amp electric and cable connection. Strong signal for AT&T 4G service from here at -90dBm. We paid $39.69 per night with Good Sam discount. Stayed for about 4 days. Sites were tight, not much patio area. Sites were paved and bushes divided each site, but felt packed in. Small Dog Park, but at least they had one. Overall, clean and well kept. Great park for overnight travelers or few days stay. Easy access from the highway but fairly quiet. Big rig friendly, pull through sites with excellent utilities. Close to local attractions and just a few miles from malls, restaurants etc. Sparkling clean pool, rest rooms, meeting facility. Nice dog park. Priced right for the type of facility. We have stayed elsewhere in the area but this is the best for our needs. Nice new campground with all concrete pads. Just right for a one-night stay - quick setup and breakdown because of the smart layout. For our very first RV'ing experience this place is excellent. I look around at others and there is hardly anything nicer. Great staff and the whole campground is cared for very nicely. The pool was great, the facilities were really nice. I did not use the showers that they provide but I checked them out. Very nice. Great price for all that is included. This trip was a test run for us going from Georgia to California in a month so overall I would highly recommend this place. We will be back as it is a so close to home and we will bring friends. Easy reservation process by phone. The representative asked if I would arrive after 5:00 p.m. (yes, but not too much later) and the directions and campground information was waiting for us on the bulletin board outside the office. Nice, clean, new campground with pull-through sites. Easy hookups. Paved roads, concrete pads. Nice pool, although weather was still too cool for use. Very clean bathrooms and showers. Easy access to I-95 with fuel and food very near by. Would definitely stay here again. Friendly staff, excellent location along I-95, easy access, modern pull through design. Stopped here on our first trip to Florida from Pa. Excellent park. Hope to stop on our way north. Long level paved pull through FHU with cable and unusable WIFI. Nice bathrooms and laundry. Close to interstate but minimal road noise. Roads a bit narrow for turns into some of the sites. Several gas stations at this exit. Nice place. Close to I 95. Very clean showers and bathrooms. This is a good place to stop along I 95. We spent the night there on the way to FL and highly recommend it. Had dinner a a place near the campgrounds called Zacherys. Good shrimp. We loved this Resort. Nice level cement spaces with grass side yards and trees and bushes to give some privacy between rigs. The roads are blacktop and roll curbs. Laundry rooms (2 one on each end of the park are super clean) The bathrooms are as nice as a 5 star hotel, really!! They are designed to impress. They are kept clean and smell fresh. They are air conditioned which is a relief from the humidity. I felt safe. The pool was large enough to allow room for a group and there is plenty of deck space for relaxing poolside. There is a dog run towards the back side of the park along the pond. Plenty of room to romp. The location is just off Interstate 95 and very convenient to St. Simons Island and JekeIl Island. RV size gas station also right around the corner. I highly recommend this place and would definitely come here again. I was told the owner is an RV'er that made sure the amenities are top notch. Well Done sir!! I would almost always get this part a five star, acting as a serious buyer however, when we were there in July there was no Wi-Fi service office just said they were waiting on "parts"? It is a big deal to us, but otherwise, this is an awesome park!! We love this campground. The location is easy off and on to I-95 and there is a grocery store and several gas stations nearby. The park is lovely and the facilities are up to date and super clean. The pool is pleasant and there is a small playground for the kids. We were only going to stay one night but, based on the convenience and appeal of the park, we stayed an extra night. We plan to stay at this park whenever our travels take us near it.